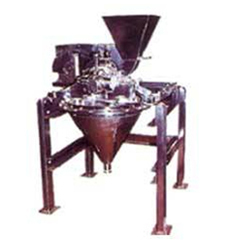 SHIVSHAKTI Micro Pulveriser is compact, low cost, highly efficient grinding mill, capable of grinding variety of products from coarse to fine mesh size. 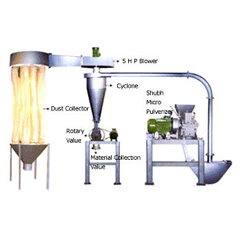 Material to be pulverized is crushed between high speed moving beaters & serrated liner & by impact between rapidly moving beaters & the particle itself, the energy of the rapidly moving beaters dissipating itself into the particles being ground by virtue of their inertia, thus causing the particles size reduction. MODEL Main Drive HP Feed Drive HP Top Rotor Speed R.P.M. Upto 300 mesh Kgs./Hr. Note : Output capacity will vary, depending upon physical properties of material.